The NHS Scholarship application process is open! Advisers must download the application procedures to distribute to active senior members of your chapter who are in good standing. Members must complete their applications by December 7. Download and distribute this information for your members today. “The first thought that actually registered once everything kind of died down was like, wow, I can pay for American [University].” Hear from 2018 NHS Scholarship recipient, Jenny Rodriguez, about the day she learned she won and how the funds will help her achieve her (and her family’s) higher education dreams. Read more. Did you know that Washington College is the first in the nation to automatically award scholarships to NHS members? All admitted NHS members receive a Washington College Academic Tuition Scholarship of at least $18,000 annually for up to four years. To qualify, students must be NHS members at the time of admission to the College. Learn more about Washington College and the scholarship. If your members weren’t able to join the live webinar series this fall, all webinars are archived and available on demand at any time. Share this link with your members today. LEAD DC and LEAD Chicago are currently both open for registration. LEAD DC early bird savings end December 31 and LEAD Chicago early bird savings end February 15. Save on your registration before the deadline. Applications are now being accepted for the Rynearson National Adviser of the Year Award. One NHS adviser and one NJHS adviser may be selected. Visit the NHS and NJHS websites to review the application requirements. 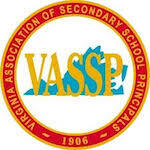 Don’t forget to register to attend the VASSP one-day workshop on November 27 for advisers and sponsors of NHS and NJHS chapters in Virginia. Participate in roundtable discussions sharing ideas, strategies, viewpoints and experiences with colleagues and leadership from NASSP and VASSP. Learn more and register here. “Has anyone created lessons or activities to teach students about the 5 pillars of NJHS? I am learning that many of my members don’t know what it means to be a good leader, citizen, scholar, etc.” What projects would you suggest to help educate students about the NJHS pillars? Join these conversations going on right now in the Adviser Online Community. Log in here with the same credentials you use for the NHS or NJHS websites. Also, stay tuned for your opportunity to earn a special gift from the national office for sharing a story with the community about a service project. Watch your email inbox for details. There are more than 7,000 project ideas available at your fingertips! Log on now to the National Student Project Database on the NHS and NJHS websites for ideas from other schools and to submit your own successful projects! As the end of the first semester approaches, advisers may start reviewing members’ GPA and compliance with chapter service requirements. Please take a moment to review the due process requirements found in Article 10 of the NHS and NJHS constitutions. This procedure is national policy and applies to all Honor Society chapters, and defines due process as a right of membership. Local chapter bylaws should reflect this procedure as well. See the “Discipline and Dismissal” section of the national handbooks for additional guidance and sample letters. Please review these procedures with your faculty council and principal, and email questions or a copy of your bylaws to nhs@nhs.us for a review to ensure compliance with national policies. Ensuring that the chapter is following the proper procedures helps to eliminate issues arising from improper dismissals. America’s schools need your vote. The November issue of Advise magazine features an article on 2018 Rynearson Adviser of the Year, Dr. Margaret Lincoln. See all of her great accomplishments along with reading the latest issue here. Tell us your story! If you’d like to contribute an article to Advise, view the editorial calendar and send your ideas to advise@nassp.org. It’s that time of year—time to save! Use promo code 18HOLIDAY and enjoy 15 percent off everything in the NHS or NJHS Store online. Shop now for membership pins and cards, graduation or promotion ceremony regalia, branded T-shirts and other apparel, and chapter supplies. Offer good through December 31. Follow us on social media for the latest NHS and NJHS news. Your complete rundown of NHS and NJHS news and activities. Add us to your safe sender list and watch your inbox for this monthly e-newsletter through June. Find archives online. Two webinars just for you! September 27, join the Director of the National Honor Societies for an overview of resources and important updates from the national office. October 10, learn how to support NHS seniors in good standing applying for the NHS Scholarship. Register today! As an adviser, you juggle several responsibilities at once. Make your planning easier by downloading our calendar with key program dates for this academic year. You’ll also find it in the September issue of Advise magazine. Download it here. Submissions are now being accepted for the annual National Principals Month Video Contest. Celebrate your principal by nominating them for this national recognition. NHS and NJHS members can register now for the 2018–19 college-planning webinars. Share this information with your members today. Outstanding Service Project applications are now being accepted. Start your NHS or NJHS application today. Join the conversations going on right now in the Adviser Online Community. There are more than 6,000 project ideas available at your fingertips! Log on now to the National Student Project Database on the NHS and NJHS websites for ideas from other schools and to submit your own successful projects! Welcome back to all returning NHS and NJHS advisers, and welcome aboard to all new advisers! The Adviser Resource Center on the NHS and NJHS websites offer chapter management tools, forms, and other information to help you kick off the 2018–19 school year. 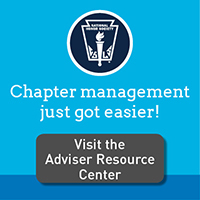 New advisers, visit the “New Chapters & Advisers” section to review the Chapter Checklist and Adviser Basics to familiarize yourself with Honor Society policies. If you have any questions, contact Honor Society Program Manager Elancia Felder at feldere@nassp.org. New: E-checks are now accepted for all product orders in the NHS and NJHS stores. 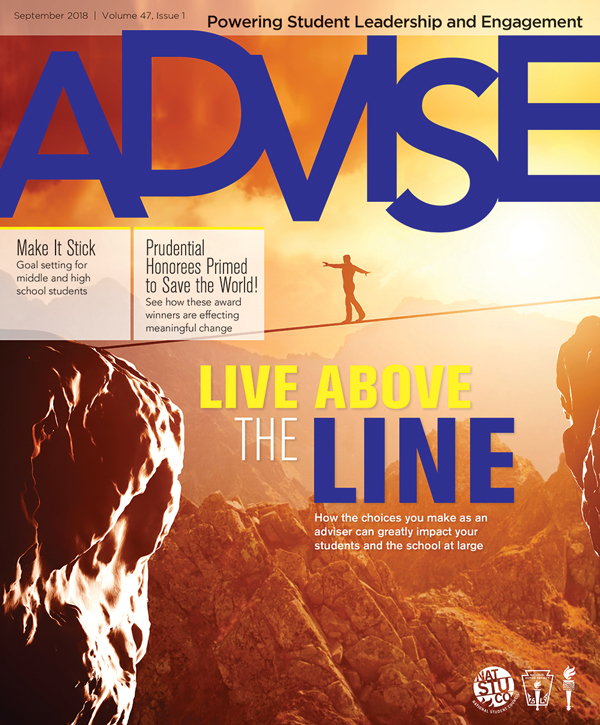 Look for the September issue of Advise, arriving in your mailbox soon! Get advice on reviving a dormant chapter in the cover feature article. Plus, read tips for preparing recommendation letters for your students. NHS and NJHS are programs of NASSP. NHS and NJHS members can register now for the 2018–2019 college-planning webinars. Share this information with your members today. Outstanding Service Project applications are now being accepted. Visit www.nhs.us or www.njhs.us to start your application today. Don’t let them miss out on correspondence from the national office. Complete the online Adviser Change Form on the NHS or NJHS websites to ensure timely receipt of all news from the national office. Visit www.leadconferences.org to register for the 2018–2019 LEAD Conferences. The first conference will take place November 2–4, in Orlando. Welcome back to all returning NHS and NJHS advisers, and welcome aboard to all new advisers! The Adviser Resource Center on the NHS and NJHS websites offer chapter management tools, forms, and other information to help you kick off the 2018–2019 school year. Have a great summer! This is the last issue of Honor Society News for this academic year. We will resume publication in August. Thanks for all you do to make your chapter a gratifying experience for your student members. The annual NHS and NJHS adviser surveys are live! Please complete the survey by June 30. After completing the survey, you will receive a code for 20 percent off online purchases in the NHS Store and NJHS Store between June 15 and August 15, 2018. Reminder: Annual affiliation renewal is due by June 30. Renew your NHS and NJHS memberships today. The 2018–19 LEAD conference season begins with LEAD Orlando. Registration opens on June 4. Energize your—and your students’—leadership and register for the event. Are you interested in contributing to NASSP publications? Consider writing for Advise over the summer. Send story/topic ideas or request submission guidelines by emailing advise@nassp.org. Did one of your chapter’s projects have a major impact this year? Consider applying for an Outstanding Service Project award. Applications for the NHS and NJHS awards will be available on July 1. Congratulations to Jenny Rodriguez of Orange High School, in Orange, NJ! She has been selected as the 2018 NHS Scholarship National Winner; she is among 500 NHS senior members to be awarded an NHS Scholarship in 2017–18. Learn more. How do you handle students who don’t include required information on the candidate form and then when they don’t get selected, they say that they did have it, they just forgot to include it/get it signed/provide documentation? Do you allow them to appeal and then provide the documentation? What circumstances do you allow for an appeal? If you have an appeals process, could you share it? Join conversations going on right now in the Adviser Online Community. Have you checked out the National Student Project Database? As you plan your 2018–19 chapter projects, you’ll find this to be an excellent resource filled with more than 7,000 projects completed by Honor Society chapters and student councils. Many entries include promotional material and photos to help guide your planning. Browse the National Student Project Database on the NHS and NJHS websites for ideas from other schools and be sure to submit your own successfully completed projects! Will you be turning over adviser duties to a new adviser next year? Is your school getting a new principal? Keep us posted about any transitions with your chapter leadership or school administration. Complete the online Adviser/Principal Change Form on the NHS or NJHS websites. Have you completed the annual adviser survey? It’s your key to savings! Once you’ve submitted your survey, you’ll get a promo code for 20 percent off online purchases from the NHS or NJHS store. Use the code from June 15 to August 15 and get what you need for the new year—pins, membership cards, T-shirts, and more. Find a link to the survey on the NHS and NJHS home page. Looking for ways to make your chapter more inclusive? The June issue of Advise includes an article with stories and best practices from chapters and councils that have had success bringing kids from different cultures together. Plus, get to know the new director of the National Honor Societies, Nara Lee. Read the whole issue online. Tell us your story! If you’d like to contribute an article to Advise, email advise@nassp.org for submission guidelines and the latest editorial calendar. Each year, the national office conducts an adviser survey to gather data about your chapter’s service projects and activities. Your responses inform our practice, programming, and services. Please complete the survey for your NHS or NJHS chapter by June 30. And after you submit your responses, you’ll get a code for 20 percent off at the online store! Registration for LEAD Orlando will open on June 4. Learn more and register at leadconferences.org/orlando. Here’s something everyone can get behind: Students changing the world together. That is the big idea behind NASSP’s Student Leadership Initiative: Global Citizenship. Visit makingglobalchange.org, read the new impact report, and get involved today! The deadline to submit affiliation renewals is June 30. Invoices have been sent to school principals. Visit www.nhs.us/renew and www.njhs.us/renew to download an invoice or pay online. Recipients of the annual Prudential Spirit of Community Awards were recognized in Washington, D.C., in April. Read the inspiring bios of this year’s recipients. Have you checked out the National Student Project Database? As you plan your 2018–19 chapter projects, you’ll find this to be an excellent resource filled with more than 6,000 projects completed by Honor Society chapters and student councils. Many entries include promotional material and photos to help guide your planning. Browse the National Student Project Database on the NHS and NJHS websites for ideas from other schools and be sure to submit your own successfully completed projects! Q: Do members have to go through selection and induction each year? A: No. Students remain members of NHS or NJHS for the duration of their time in middle school (NJHS) or high school (NHS). During that time, membership may only be ended through written resignation or dismissal. There is no yearly reapplication for membership or induction. Dismissal and resignation are permanent. Advisers should monitor members’ compliance with chapter requirements throughout the year. If a member falls below the chapter’s standards, advisers must follow the due process procedures outlined in Article 10 and in the Disciplinary Procedures section of the handbook. At no time can a reapplication process be used to end a student’s membership. Complete the annual adviser survey to unlock your promo code for 20 percent off online purchases from the NHS or NJHS store. The code is good from June 15 to August 15. Get ahead on purchases for the new year—pins, membership cards, T-shirts, and more. Find a link to the survey on the NHS and NJHS home page. Want to navigate your students on the path to leadership? The April/May issue of Advise features the perspective of guest author and motivational speaker Omékongo Dibinga on the topic. Plus, don’t forget to tear out and share the centerfold with students. It’s called “Participation Station” and it’s all about the career journey. Read the issue online. I often recite these two lines from a poem I wrote on leadership when I speak to student leaders around the world. I share this quote to underscore two points. First, leadership is not for everyone. Though everyone can be a leader, leadership is a calling that few people answer and, therefore, it must be carefully considered. Second, leaders must always be thinking about why they chose to be a leader, and whether they still have the capacity or even the desire to lead. In today’s political climate, these two points are more important than ever for student leaders. Donald Trump’s presidency has not only shaken up our system of government, but it has also had an impact on every aspect of our society, even schools. Some students feel that they have a leader in office who can speak for them in ways that President Obama could not (or didn’t). Others believe that President Trump’s rhetoric makes them less safe in school. It requires students to evaluate whether or not they are built for the task of leadership today. I challenge student leaders to jump headfirst into whatever challenges their schools are facing. The example of America’s political climate is on the more extreme side of challenges student leaders may face in school, but there are a multitude of other challenges that students face, from cafeteria food and infrastructure to curriculum and school climate. Regardless of the issues, I advocate four simple steps that student leaders can implement to help them better navigate these issues. These four principles—give, release, overcome, and win—stem from my book G.R.O.W. Towards Your Greatness! 10 Steps to Living Your Best Life. First, students must review the quality and quantity of their giving. Student leaders cannot be self-absorbed and only concerned with the title of leadership as a résumé builder for their college applications. Their elected position (in many cases) means they must remember that they represent their constituents, even those who did not vote for them. To that end, encourage your student leaders to be giving of their attention to all students in their school. Emphasize that student leaders need to be able to do more listening than talking to really understand what is transpiring in their school, and they must be willing to give of their time to lead the effort toward effective change. As the old adage goes, we have two ears and one mouth, and we should use them in proportion. National Student Leadership Week (NSLW)—which happens April 15–21 this year-provides an easy way to jump-start your group. As part of NSLW, student councils and chapters of NHS and NJHS are encouraged to plan a special project to show how student leaders positively impact the school and community. For ideas, browse the National Student Project Database, which offers thousands of project and activity ideas completed by Honor Society chapters and student councils. Student leaders need to let go of any hatred (or even a simple bias) they may have toward certain groups. I study leadership across the globe, and I’ve examined the practices of leaders including corporate CEOs and national leaders. I have seen situations where someone becomes a CEO and actively works to undermine particular departments they simply do not like. I have seen situations where someone becomes president of a country and exacts revenge on the ethnic group they view as their oppressor. I encourage student leaders to practice forgiveness and inclusivity, similar to what former South African President Nelson Mandela did. Upon his release from 27 years in prison, Mandela went to visit the homes of his former prison guards to express forgiveness. Once students release negative biases, they can work toward a second step of “release”–releasing people around them who no longer represent where they want to go as a leader. I tell leaders that they are a direct reflection of their five closest friends. If their friends are racist, homophobic, Islamophobic, sexist, petty, passive-aggressive, or express other biases, chances are the leaders are as well. Student leaders must associate themselves with people who represent not where they are, but where they want to go. Also, especially in this world of social media, student leaders need to understand that they must be careful with their “friends” and what they post on social media because colleges and potential employers can view these sites to gain information about the student. An article titled “Social Media Trends in College Admissions: What to Know for 2017” on educational consultant site Ivywise.com shared results from a Kaplan Test Prep 2016 survey of nearly 400 college admissions officers across the U.S. It found that “37 percent of admission officers have found things online that could negatively affect an applicant-mostly illegal activity like underage drinking, other criminal offenses, or inappropriate posts or behavior.” As an alternative, “Keep your profiles clean and use them to highlight your activities and interests,” notes the article. Student leaders must overcome their fears, as this feeling keeps people from thinking clearly. Students must be guided by their goals and their vision—not their anxieties. One cannot serve effectively if they are governed by worry or distress. Fear can keep students from even attempting to start a program because they’re concerned about what people will think. Author and motivational speaker Zig Ziglar said that fear simply means “False Evidence Appearing Real.” This means that most of the issues people worry about will not happen, so instead they should focus on working daily toward their goals. As Dr. Martin Luther King Jr. said, “Cowardice asks the question, is it safe? Expediency asks the question, is it politic? Vanity asks the question, is it popular? But, conscience asks the question, is it right?” Student leaders must acknowledge the fear they may feel, but focus more on what is right. Leadership can be a daunting task, but it is a task worth pursuing if student leaders are truly interested in serving their communities. Student leaders must believe they will win. While this is easy to say and embrace in theory, students will likely need to be reminded that some of the changes they seek in their school may not occur during their tenure as a student leader. Remind students that at one point their school may not have allowed women or students of color, but people fought for the right to attend those schools—even though some fighters for equality never got that opportunity themselves. In this age of instant gratification, student leaders must practice patience; change does not happen overnight. Some Native American communities believe that they should consider how their actions will affect people in seven generations, and that’s the kind of mindset strong leaders should adopt. At the end of the day, if students look at how they give, release, overcome, and win, they can become effective leaders for their school community. Encourage your students to use these four steps to evaluate their position in leadership; they will better understand the serious job they have as leaders in their school. Whether it is the National Honor Society or student council or any other form of leadership, it comes with the unwritten understanding that students realize the great responsibility of the leadership roles they have undertaken. As advisers, you can be the ones who help them along with this process. Your experiences as educators and leaders in your own environments can greatly aid students in their development. Consider taking your group to a conference (like a LEAD Conference) to get student leaders immersed in national discussions, and to help empower them to be strong leaders. I fully believe that with your guidance, our student leaders of today can continue on their path to the greatness that we know is inside of them. Omékongo Dibinga, PhD, is a motivational speaker, author, rapper, and professor of cross-cultural communication at American University in Washington, D.C. He conducts training for teachers as well as students on issues related to cultural competency, diversity, and leadership. The theme for the 2018 National Student Leadership Week (NSLW) is “Make Your Mark on the World: Dream. Lead. Serve.” The national office of NatStuCo, NHS, and NJHS has sponsored NSLW since 1972. This year, the national office is challenging student leaders to really take this theme to heart. Rather than reporting what they have been doing, the national office wants them to share what they want to do. What is their dream? Have your students pitch an idea for a great activity or event for your school or community, or share how they’d like to add a new twist to a traditional event. If their pitch grabs the judges’ attention and explains why this activity or event is needed or beneficial for your school or community, NHS, NJHS, and NatStuCo may help fund it! Several $250 micro-grants will be awarded to councils and chapters to assist in funding these projects, activities, events, and ideas. Create and share your pitch on social media with #OurDream18. Visit the NSLW webpages for more details and contest instructions: www.NatStuCo.org/nslw, www.nhs.us/nslw, or www.njhs.us/nslw. Need an Idea? Share an Idea.